Hello friends! I hope you are having a great week so far! I've been wanting to play along in the Papertrey Ink Blog Hops that occur every month, but each time the date comes around, I end up too busy with life and/or other commitments. After seeing Nichole's challenge (to use an uninked or dusty PTI set), I had hoped to be able to play. Although my morning didn't start off well, I managed to squeeze a little crafting time in this afternoon.. here's what I came up with.. I decided to pull out a few uninked sets.. first, I created some patterned paper (left side) by stamping the text from Background Basics: Hearts with Pure Poppy ink. I added a strip of heart patterned paper next to it (from Simple Valentine). For my circular image / sentiment panel, I embossed the white heart border from 2010 Love Tags. Next, I popped the little Happy Valentine's Day sentiment (from Tiny Treats: Valentine) in the center and stitched all of this onto a Lacey Circle. I can't wait to hop around and see all the creations (complete link list is here).. thanks so much for stopping by! 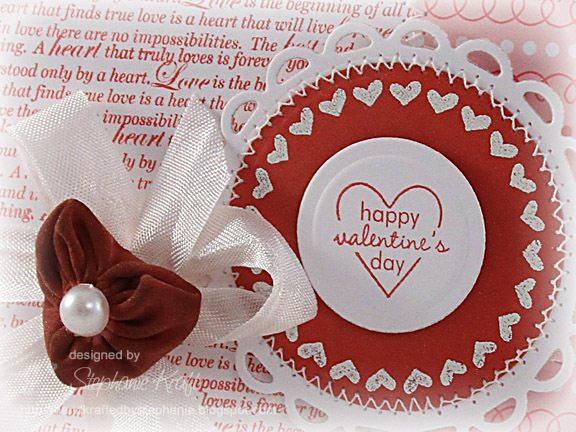 Accessories: Standard Circle and Lacey Circle Nestabilities (Spellbinders), Mini Hearts border punch (Martha Stewart), White embossing powder, Pearl, Seam binding ribbon, Glimmer Mist (Tattered Angels), Chiffon fabric, Foam tape, Thread, Sewing machine. OH, I love this. Nice card! This is lovely! Love the patterned paper and the layered sentiment! Love the red, and such a perfect time to dust off those sets. This is lovely! I like the pattern paper you created :)And the ribbon is the perfect touch!! Gorgeous card! I love your design, the white/red/pink color combo, stitching and the heart yo-yo! And congrats on winning My Mind's Eye Blog Challenge 19 - another gorgeous card! I love red and white and this is gorgeous. Your sewing is perfect. This card is put together so perfectly...every little detail in the right place! Love the stitching and the layered circle with the hearts! So pretty. Love all the details you put in to making this card. SO pretty Stephanie!!! Your layout is great, and love that focal image! Good to "see" you :) Hope all is well!!! I love a great valentine card and yours is perfect!! So sweet, pretty and RED! Wow! This is so pretty! I love the bright red and the bow is so pretty..especially with the addition of the velvet heart. This is so pretty! Love it! The colors just pop! I love the focal pieces you created and the white ribbon is the perfect accent! Stephanie this is GORGEOUS! Love the bow and the little heart! So pretty! Aack! I KNEW I should have bought Love Tags! This card is absolute perfection, and I love everything about it, from the colors to the layout, to the stitching, to the bow, well, EVERYTHING! ahhhh, what a delicious, romantic card this is Stephanie, I absolutely LOVE IT!!! What a super sweet Valentine's Day card! This is a Beautiful design. Classic V-day colors, which I love. I won Love Tags during the December release - need to get those puppies inked up! Thanks for the inspiration! Oh my gosh.... look at how you STITCHED THAT CIRCLE to the LL shape! I ♥♥♥ it!! This card is BEE-U-TI-FUL!! Thanks for the inspiration! GORGEOUS card! LOVE the red, pink, and white! LOVE the text paper you created! LOVE LOVE LOVE the chiffon abd pearl embellie! Looks like a heart! Oh this is just Valentine goodness! I love that heart yoyo and the text paper! Beautiful! My first thought was "Where did she get that great text patterned paper?" As I read on, I realized you made it, and I actually have that stamp set too! What a beautiful card, love the use of the 2010 Love Tag heart frame with the TT heart in the middle. Great job. *SWOON* this is pure fabulousness! Great job! Beautiful card. The papers, colors all come together to form a perfect valentine card! I love it! 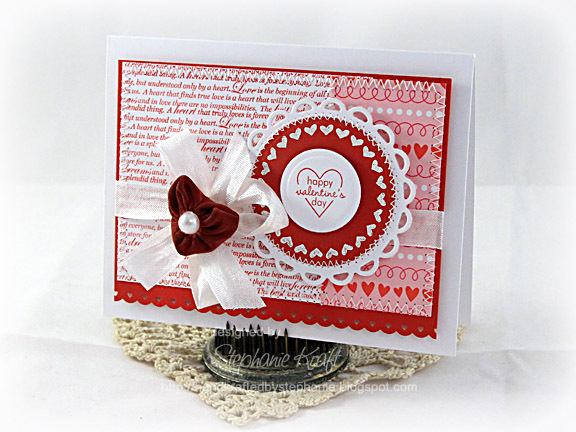 The stamped background, the patterned paper, the lacy circle--just a wonderful card! This is just gorgeous!!! Absolutely stunning. Your background paper is so fun and pretty.....and your focal image is just wonderful! What a gorgeous valentine card! I love everything about it, especially the sewing. I really need to do this more. Thanks for the inspiration!